KNOXVILLE — A third-generation farmer from Jackson who manages more than 5,000 acres of row crops has been named the Tennessee Farmer of the Year by University of Tennessee Extension. Johnny Verell, who farms in partnership with his father and grandfather, John Verell, Jr. and John Verell, Sr., rose to the top of the competition because of his business savvy, his land stewardship and his devotion to community service. The youngest Verell began farming in 2005 – 40 years after his grandfather started the family business. At first he was entrusted with just 50 acres of the family’s 2000 acres, which he planted in Delta & Pine Land cotton. Now he manages the entire 5,050 acre operation. At his direction, Verell Farms, as the business is known, has moved away from cotton production to cultivating wheat, corn and soybeans; lots of them. With the help of technology and precision agriculture, Verell’s irrigated acres of corn have been known to produce in excess of 300 bushels per acre. In 2017 USDA estimated the U.S. average yield of corn to be 171.8 bushels per acre. What’s more, at 65 bushels per acre of full-season soybeans, Verell produced well above last year’s national average yield of 49.5 bushels per acre. 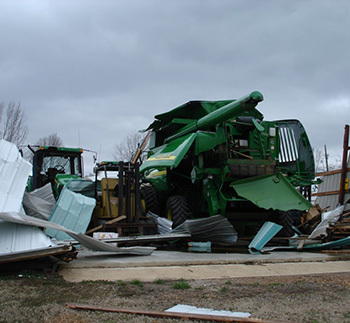 Over the years Verell Farms has seen its share of challenges, including the fateful Super Tuesday Tornados of February 2008 during which most of their equipment and the homes of John Sr. and John Jr. were destroyed. Photo used by permission of Verell Farms. Since that time Verell Farms has expanded to include not only the original family owned land but also some additional 3,000 acres of rented cropland. All of it, Verell knows, contains the secret to his future success. He manages all of the land for sustainability, including installing wildlife food plots, planting buffer strips along the edge of streams and using best practices that reduce the amount of fertilizer and pesticides applied to the crops. He has even planted 20 acres designed as pollinator habitat to help native bee populations survive and thrive. Verell will be introduced as the Tennessee Farmer of the Year in August at the Tennessee Farm Bureau President’s Conference in Franklin, Tennessee; at the Tennessee State Fair Hamburger Grilling Contest for Media, which is sponsored by the Farm and Forest Families of Tennessee; and at the UT Institute of Agriculture Ag Day celebration which is scheduled for September 22 in Knoxville. 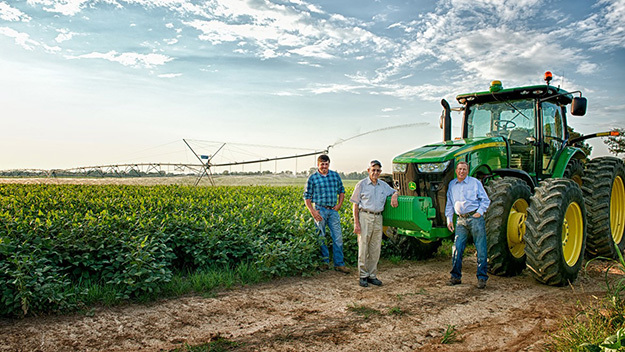 Three generations of John Verells farm in partnership in Jackson, Tennessee. The youngest, Johnny (shown left in attached photo), has been named Tennessee Farmer of the Year. ​The three are shown on their operation, Verell Farms. John Sr. is shown center and John Jr. is shown on the right. Photo used by permission of Verell Farms. According to the graduate of Jackson State Community College – Johnny holds an associate degree in precision agriculture from that school and a B.S. in agronomy from Murray State University - the honor of being the Tennessee Farmer of the Year does not belong to him alone. All three John Verells have daily input into the success of the family business, and the youngest considers the farm’s employees – who happen to also be skilled tradesmen - to be critical to the success of the operation. Finally, the support of his wife Crissy and his daughter Emmi has been invaluable. Both Crissy and Johnny have been involved in many agricultural and community activities. 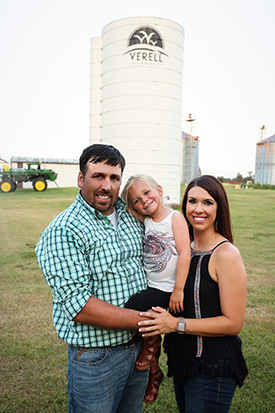 Johnny has been a member of the Madison County Farm Bureau Board of Directors since 2006. His father and grandfather have also served on many boards. And Johnny was the state and national American Soybean Association Young Farmer of the Year in 2012. Both he and Crissy are active in the North Jackson Church of Christ, and both support “Lights, Camera, Fashion,” a benefit for St. Jude Children’s Research Hospital as well as several other events for the benefit of children with special needs. As Tennessee Farmer of the Year, Verell will compete in the Southeastern Farmer of the Year competition at the Sunbelt Ag Expo in Moultrie, Georgia. That competition chooses from among the top farmers from 10 southeastern states and is sponsored by Swisher International, Inc. The award recognizes excellence in agricultural production and farm management, along with leadership in farm and community organizations. The award also honors family contributions in producing safe and abundant supplies of food, fiber and shelter products for U.S. consumers. The overall Southeastern Farmer of the Year will be announced at a luncheon on the opening day of the expo, October 16.